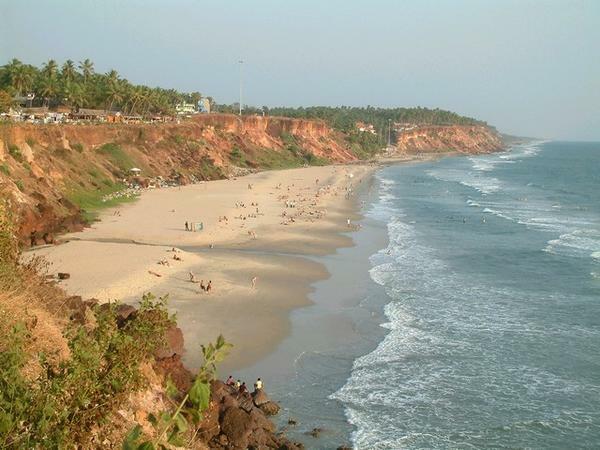 Varkala is a town in the Indian state of Kerala, about 50km north of Trivandrum and is home of the popular Papanasam Beach. Varkala is quite a new place to hang out in India and has only been developed as a tourist destination in the last years. Slowly even the north of Varkala Beach gets developed for tourists. 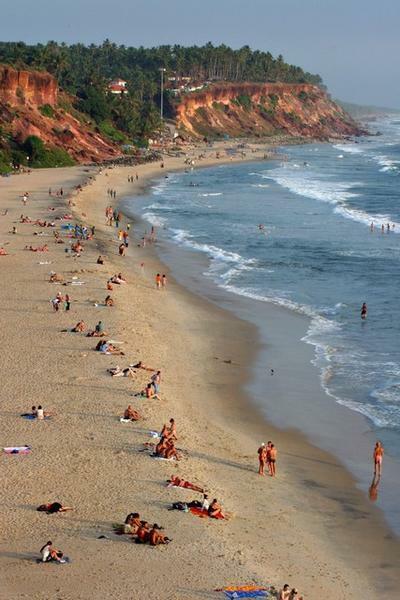 If you're looking for beaches and are fed up with the crowds and prices at Kovalam, then it’s well worth checking out Varkala. In the off season it’s really mellow and relaxed, swims and sleeps and chill out. Only in December does it get really busy and prices start rocketing till January/February, when it starts to quieter down. The main season starts from Dec 1st- March 31st, with December & early January experiencing the biggest rush. Shree Janardhana Swamy temple, Sivagiri, Nature Care Centre, Varkala Tunnel, Fishing Hamlets of Anjengo and its British Fort, Coir Processing Centres, Edava Beach. Chill out lounge, north cliff, varkala. a chilled out atmosphere for food, drinks and music! Oootapura Vegetarian Restaurant is almost the first restaurant you come to from the helipad. It is very good but does not serve beer. 1. Government Guest House, (located next door to Taj Garden Retreat), +91 472 602227. Former Maharaja's summer palace, a bit run down. 2. K.K. House, (Behind temple, south cliff. A place ideal for relaxation and comfort. Price ranges from Rs 200-350), +91 470 9388720200. 3. Bamboo Village, (near North end of cliff), +91 470 2610732. Individual huts around a small garden facing the sea. ~Rs.700. 4. Baby House, (next to Chill out Lounge, north cliff). Double with TV, A/C and fan plus balcony for Rs 250. Clean room, nice owner. 5. Sherin Cottage, Thiruvambadi Road (close to Durga Temple), +91-984-770-8206 (sherincottageindia@yahoo.com), check in: anytime; checkout: 12:00 pm. newly remodeled Sherin Cottage is located 3 minutes from the crowds of the cliff scene. All bedrooms have private baths, screened windows, fans and free Wi Fi. Massage rooms offering Ayruvedic or Swedish style massage. Nice garden with hammocks for lounging. Rs 300-800. 6. Silver Estate (Soulmakers), middle cliff, kurakani road, +919387755309, Silver Estate offer rooms (clean w/ attached bathroom), restaurant (Indian & Italian food), garden, chill out area, art... Part of the Soulmakers Pvt Ltd, it is the front line of an eco-socio-cultural project for an eco-sustainable future. 250 to 450. 7. New Heaven, (just by Black Beach/the Northern beach). Checkout: 12 noon. Located very close to Black Beach, with 24/7 hot water for bucket baths and fans in rooms. Rooms are clean and tidy. Raj, who works there, is always around and helpful. However, some travelers were promised a free transport from the bus station by Najmudeen and then later forced to pay R. 1000 for the trip. ~Rs 300-550 in low season, Rs 750 - 1000 in high season, depending on length of stay and whether you have a ground floor or first floor room. 8. AsinMomo Homestay, Manthara, Edava (on the seaside past the Manthara temple in Edava, about 20 min walk north from Varkala Beach), +91 4702 661112 (asinmomo@yahoo.co.in). A home stay, bed and breakfast. Simple, comfortable rooms with attached shower/toilet. WiFi, garden, sit-outs, home made food and drinks, yoga and a washing machine are there and very close, some nice and peaceful beaches. English, Malayalam, Hindi, German, French, Italian and some Spanish spoken. Rs 250-700 pending on length and season. 1. Sea Splendour, (1/2 km North of cliff), +91 470 2662120. 2. Seapearls Chalets, (South cliff), +91 470 2605875. 3. Clafouti Heritage Beach Resort, North Cliff (Call from the train station and they will arrange pickup), +914702601414. 5. Casa Eva Luna, Off Kurrakkani Road, Varkala 00919946069770. It happens so many times that while you are looking for some good holiday resort India, you end up choosing one that not only suits your style but has that idiosyncratic deluxe ambience. Hence, Jaypee is one out of them where luxury galore and sumptuousness emanates!